This year I have decided to participate in the Blogging from A-Z April challenge. The idea is to write a blog post each day in April except for the Sundays. By choosing a theme I hope to stay on track for each letter of the alphabet. The theme I plan to follow is "A-Z of useful apps" Most of these will be mobile apps that I use regularly and which are suitable for a variety of platforms but occasionally I may wander into a desktop-only application. I hope my tips on favourite tools will be useful to a wide variety of people, including family historians. My list of apps A-Z is ready to go in one of my favourites, E for Evernote. 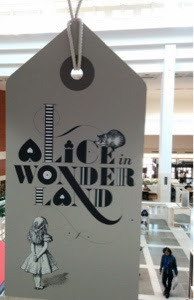 While in London to visit a newly arrived grandchild and his parents, I've had the opportunity to visit the British Library and view the wonderful exhibition mounted to celebrate 150 years of Alice in Wonderland.The giant luggage tag hanging in the foyer promises a journey into the heart of the making of and the interpretations of this story throughout the years. An inspiring collection is displayed showing the work illustrated in different manners and modes. There's the original illustrations by Tenniel, and adaptations of these by a variety of artists. The flapper 20s style has the pack of cards kicking up their heels in a becoming manner. Who would have thought that during the London blitz the Mad Hatter's tea party would be illustrated with 'rations in a Molotov bread basket'? Another version has Alice as a Brownie peering seriously into that hole. Also on display are the versions illustrated by Mabel Lucie Atwell and Ralph Steadman. The original handwritten text has its own display case telling the story of the American purchase from the estate of Alice Liddell to the ultimate return to the British Library as recognition of the role of Britain during the second World War. Posters of the Cheshire cat in pyschedelic colours reflect the 60s. Puzzles, games and cards based on the book are also on display along with Disney interpretations of the story. As no photography was permitted within the exhibition area I have relied on a few notes made on my phone. Maria Popova's Brain Pickings post here provides a look at the works of some illustrators. Those who are in London before April 17th have the opportunity to enjoy these treasures brought together by the British Library. The excellent Treasures of the British Library is always on display in the gallery. 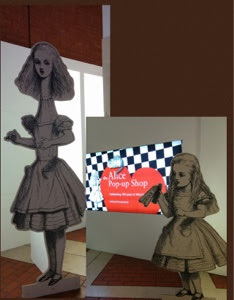 I leave you with the two versions of Alice near the entrance to the inevitable pop-up shop that accompanies the exhibition. 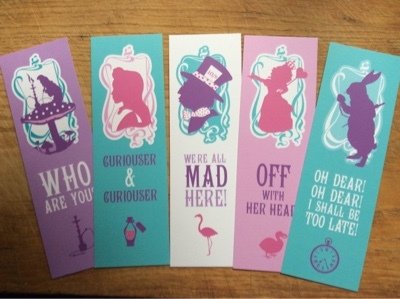 The second picture is a collection of bookmarks I could not resist, after all...We're all mad here! The importance of Trove as a community resource vital to Australia cannot be over emphasised. The development of this valuable resource by The National Library has made historically important information in a wide variety of formats available to all. The Trove API facilitates the development of innovative programs. One such adaptation is the code for developing an exhibition of Trove materials. My great grandparents were married at Teetulpa in northern South Australia in 1887. While investigating what life on the goldfields may have been like for them in the 1880s, I unearthed many interesting reports, books and images in Trove and compiled my findings into four separate lists. Recently Tim Sherratt shared code to make a D-I-Y exhibition from Trove lists. This is an ideal way to display content in a range of lists from Trove, particularly those lists with visual elements. This was my first venture onto github.com and although I have limited coding experience Tim’s excellent instructions were simple enough for this retiree to follow. His original version of an exhibition is Forecasters: An assortment of weather prophets. He has written more about the process here. Here’s my Teetulpa Goldfields exhibition. These interesting exhibitions have been created using Tim's code. I’m sure there are plenty of others out there as yet unseen by me. The Chinese in NSW: A history in pictures to 1940 by Kate Bagnall. This is a wonderful collection of resources compiled to complement Celestial Empires at the NLA. Explore Canberra in Trove a snapshot of the 1950s, 60s and 70s by Catriona Bryce. An interesting look back at the national capital through the years. Queen’s Hall at the State Library of Victoria by Katie Flack. Great views of the Queen’s Hall throughout the years. A tour of the Southern Highlands by Catriona Bryce. Love some of the fashions displayed here. French Stuff: Un assortiment de ressources issues de la bibliothèque nationale d'Australie by Antoine Courtin. Thanks Tim for sharing the code and providing the inspiration. Now is the time for the government to #fundTrove and provide for its ongoing and future development in order to ensure the viability of this resource-rich national treasure.